Topics: Audio Visual Division, Interiors Division, Voice & Data Division, Digital Signage, Display Systems, and Control And Signal Integration. Fasthosts Internet Limited - Uk S Largest Web Hosting Company (England, Gloucester) is the location of the Microsoft-IIS/6 server. 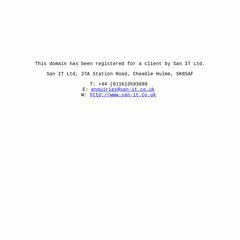 ns2.livedns.co.uk, ns3.livedns.co.uk, and ns1.livedns.co.uk are its DNS Nameservers. It is written for ASP.NET language. PING www. (213.171.218.48) 56(84) bytes of data.